Reading is vital for all of our grandchildren. The more they read, the better they do in school. Plus, the right books can help them learn important facts without ever realizing they are “studying.” There’s a ton of books to choose from, though, so how do we grandparents know what to pick? This Sandwich Generation granny nanny pre-reads many of the books herself! When my kids were young, I did the same thing. Now that it’s grandkids, I admit I skim more often if the books are long. And with the grandkids getting older, it's definitely getting harder. 🙂 I also have learned to stay with many of the tried and true books from my kids’ childhood as well as my own. It’s always fun, though, to find new ones and I have a special one to share with you this week. It was submitted to me to review and I was delighted to find that it was both enjoyable and educational, two of my top criteria. 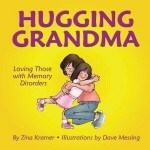 Hugging Grandma: Loving Those with Memory Disorders. This delightfully illustrated picture book starts off introducing you to Grandma Sylvia. Told through the eyes of her young granddaughter, you see what a great relationship she had with Grandma Sylvia. I say had, because Grandma Sylvia has developed Alzheimer’s Disease. She no longer remembers the things her granddaughter and she used to love doing. Her grandma gets sad at times and is starting to need a lot of help taking care of herself. 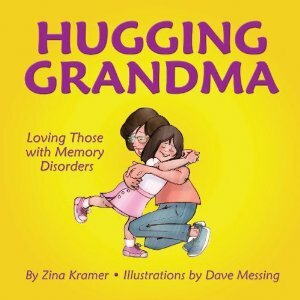 Zina Kramer has written such a sweet book that would be a great addition to any child’s library but it's especially useful as books for kids and grand children who have a family member or friend going through Alzheimer’s Disease or other dementia symptoms. The story has some great activity ideas for children to help with and encourage their beloved senior, such as sing them songs, make a photo scrapbook, and help them with chores. In addition, there is a list at the back of the book with more ideas and information to help your whole family as they deal with the realities of dementia symptoms care. This would also be an excellent book to give to a school library or utilize with your grandkids' homeschooling programs. If they are part of a homeschooling group that keeps a booklist, I would definitely suggest adding it to the list. Any time one of my grandkids is going through a trial or special challenge, I always like to find story books to help them, educate them, and encourage them. We're always blessed when we learn we are not alone in our struggles. This book accomplishes that wonderfully. I really liked it and will definitely keep it in our library. It is geared more for younger children, but even an older child might appreciate it if they were in the throes of this situation. Thank you so much for stopping by. This book sounds sweet.